Rosie’s Roamings October 2017 - I'm your PA : The virtual assistant company that likes to make you smile. Our Rosie has been off on her jollies again! A whole week in Wales with her Mum, Auntie Tina and best friend Rosie Two, the little Jack Russell. Now if Mummy and Auntie Tina clocked up sixty miles in six days, you can imagine how far the two Rosie’s ran! 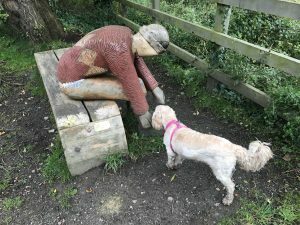 We hired an amazing cottage just opposite Rhuddlan Castle as a base which I can highly recommend (for details click here), it was warm, well equipped and accepted Rosie One and Rosie Two. A trip to Llandudno and round the Great Orme, proved to be initially boring down to the amount of pavement walking, although once we cut across the top of the Great Orme we were met with amazing views and beautiful countryside. Anglesey was an experience with a “four mile” circular walk from South Stack the RSPB centre. We soon lost the pretty purple markers as these seemed to have been replaced by white markers – bad decision to follow those!! Before we knew it we were actually descending into Hollyhead and miles from where we should have been! That’s when Mummy had a brilliant idea – look at Runkeeper to lead us back to the car! In principle the idea was good, in practice it was a nightmare as first of all we were met by a quarry we couldn’t cross and then having backtracked we ended up walking across a gorse field, where the two Rosie’s had to be carried! Unfortunately Mummy went flying and ended on her ar*e in a gorse bush and is still picking bits of gorse out of her hands two weeks later! This time instead of travelling straight home we decided to stop at Pystll Rheaddr on the way, fabulous countryside and the largest waterfall in England and Wales. Whilst we were only able to do a short walk there, which was up a very steep hill, we have decided that this is definitely a place to go for a days walking, probably next summer. If you are around Wolverhampton sometime, why not pop into the offices and come and see Rosie – don’t forget to bring a treat!